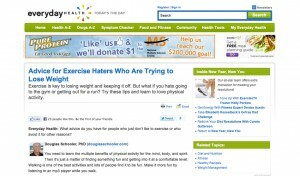 Julie recently was interviewed for an EverydayHealth.com piece about how to stay motivated to move! Here’s what she had to say…. Everyday Health: What advice do you have for people who just don’t like to exercise or who avoid it for other reasons? Julie Upton, MS, RD (appforhealth.com) Former national spokesperson, American Dietetic Association. Call it something else and get on with it. We have to move our bodies — period. Of all the things there are to do to move, find something you like and do it. I think people who do a variety of activities tend to be the ones who stick with it, and morning exercise seems to be the best for sticking to a schedule. Gardening, walking the dog, taking stairs, doing basic strength exercises while watching TV all count. Just do something — every day if you can. You need to learn the multiple benefits of physical activity for the mind, body, and spirit. Then it’s just a matter of finding something fun and getting into it at a comfortable level. Walking is one of the best activities and lots of people find it to be fun. Make it more fun by listening to an mp3 player while you walk. Find something you like to do and it won’t feel like exercise. I couldn’t keep a commitment to the gym if I tried, but I walk my dog twice a day in the hills around my home and I love to flamenco dance, so I take twice-weekly classes and rehearse and perform regularly. Love going on a long chatty walk with your favorite friend? Make a regular date to do so. Love Latin music? Try Zumba. Get so stressed at work that you feel like hitting your boss? Try a kickboxing class. Whatever it is, do it regularly because it’ll make you feel great — when you pay attention to how good any form of activity makes you feel, it’ll make you want to come back for more. For those who are resistant to exercise, I often find that they’re thinking of the gym. You don’t have to go to a gym to exercise! There are many other things you could do, such as play basketball, squash, or tennis; throw in a workout DVD; or hike, do yoga, walk, or run outdoors. Find something you like and keep it up at least two or three times a week. Suddenly, you’ll start to feel better. Once you feel better, you’ll be pushed to live better — and healthier. I encourage my clients with this same approach. Through eating right and exercising, they start to feel good and they begin to see and feel results, causing exercise to become a part of their daily routine, which simply enforces healthy eating. After all, who wants to refuel their body with high-fat, sugar-laden foods after a good workout? My advice is simply to find an activity you like and to stick with it. Soon, you’ll be venturing into other types of exercise and exercise will become a part of you. For those who say they don’t have time, make time. You’ll see that you’ll become more efficient, be in a better mood, and will think more clearly. Don’t exercise to lose weight. Exercise because it’s essential for good health. You will pay the piper sooner or later if you don’t exercise. Your quality of life will definitely decline as you age if you don’t exercise. Start off small. Even a 5-minute walk, seven days a week, is better than no exercise at all.